credit crunch kitchen: Bulgar tabbouleh with harissa spiced kebabs and harissa dressing. Bulgar tabbouleh with harissa spiced kebabs and harissa dressing. I've been trying to use up half-used jars and packets as my larder is stuffed full. I just can't resist buying something new and interesting but then we only seem to use half and stash it away for another time. You may have realised I don't generally repeat meals very frequently, so I either need something new to do with the ingredients or for something to have been really popular to repeat it! 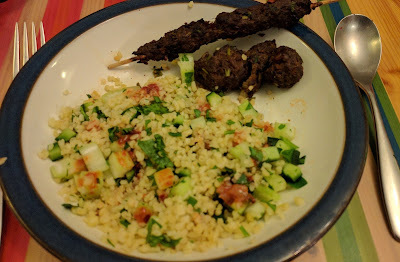 This dish used up an open pack of bulgar wheat and a jar of harissa, and it also used a good portion of the parsley I bought in the corner shop the other day. I also had some celery going a bit floppy which was chucked in too. I began by cooking the bulgar wheat for the tabbouleh. The one I have is cooked in a pan with double the volume of boiling water and simmered for 7 minutes. I then fluffed it with a fork and emptied it into a large salad bowl. I then added finely chopped parsley leaves, and finely chopped cucumber and celery and stirred it all through. So as not to waste anything, I put the stalks of the parsley, chopped finely, into a bowl with a pound of lean beef mince. I then added a teaspoon of salt and one of ground pepper. Next, I added a couple of tablespoons of harissa and a teaspoon of cumin powder also. I mixed this all very thoroughly and left it to marinade. Using the tablespoon or so left in the harissa jar, I added the juice and chunky flesh of one lemon, half a teaspoon of salt, and a teaspoon of honey. I shook this all together in the jar to make a dressing. Finally, I divided the meat between 12 skewers making either 3 walnut sized meatballs per skewer, or a long thin sheekh kebab shaped "sausage" - many cultures would call these "kofte". I like how these turn out in the halogen oven, but a grill would also have a similar effect. They took about 12 mins to cook in the halogen, and I love how the edges get crispy. The littler 2 kids don't like anything even slightly spicy, so they "dressed" their tabbouleh with lemon juice from a bottle, but Big'Un and I enjoyed liberally drizzling the harissa dressing onto ours. Vegetarians could try the tabbouleh with griddled halloumi and vegans could easily use harissa brushed tofu, or just some tasty crunchy baked chickpeas - and omit the honey from the dressing, of course.